Standard - $80.99 Only 7 left! The majority of clowns you've come into contact with thus far enjoy making people laugh— but not this clown right here. He likes to get his jollies a different way. Instead of making people laugh, he likes to make them scream, run in terror, or jump a foot off the ground. To be fair, his horrifying appearance lends itself to this. He's not going to make anyone giggle with those heart-stopping red eyes and long bony fingers so scaring people is his passion and around here, we support passions. If you also support this scary clown's love for spooking the unsuspecting, allow him to hang around your home. Hey, you may even find that being scared is fun. (We think it is!) Maybe it will give you the morning boost you need before work or school. Take our word for it, it's a better jumpstart than downing a cup of coffee! 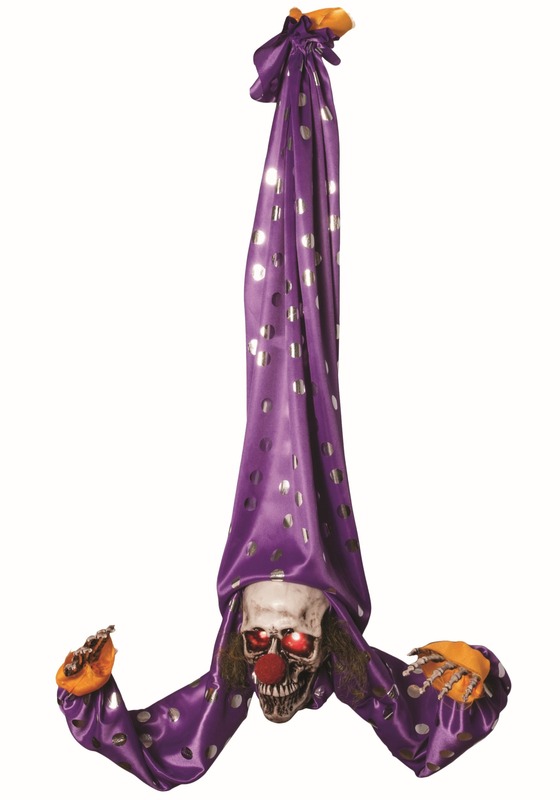 The animated upside down clown decoration is approximately 3 feet tall and hangs up at the feet. Once the batteries are in place, this clown waves his arms while various audio tracks start playing and his eyes light up too. This prop is motion or sound activated so it's the ultimate creepy clown decoration. Use this clown decoration to inspire a whole scary clown scene because nothing says "Ahhh!" like a big red nose!